for the educational welfare for the poor and left-behind students. referred to these indicators as process indicators. ity (Ogawa & Collom, 2000; Petty & Green, 2007; Stecher, 2005). tion data connected with opinions from teacher and students , etc. and high-qualified teachers (Jones, 2007). organization, which provides an operational core for schooling. understood as “an object of understanding” (p. 72). needs in their own way within specific contexts (E isner, 2002). ability policy is focused on students’ academic performance. in terms of their organizational contexts and cultural norms. countability (Stufflebeam, 2001; Stufflebeam & Shinkfield, 2007). parents and students satisfaction in terms of product indicators. method for improving student achievement by a school year. sc hoo l pr o gra m. Acc o rd in g to Mars h , Pa ne a nd Hami lt o n (2006: p.
elaborate on how five elements are correlated with DDDM. The conceptual structure of DDDM. connecting factor between users-generating or supporting users. co u nta bility, and school effectiveness. ship, climate and culture within a school or across schools. cators into two categories: organizational and instructional data. and leadership at the level of school, district, state, and nation. interaction working within a school. ability (DQC, 2006: p. 5). of schools in low-income or affluent areas (Berry et al., 2006). efficient resources and advice (Laird, 2006). their instructions, and to distribute and share school leadership. use result in creating “collective leadership” and “data-based team”. effectiveness and accountability (Harris, 2008). talk” or “communication” with teachers (Lachat & Smith, 2005). tiveness (Marsh, Pane, & Hamilton, 2006). districted from their attainment of standards and goals. to get the standard data from a distinctive school. and DDDM (Loeb, Knapp, & Elfers, 2008; Valli & Buese, 2007). and a learner (Cindy & Joellen, 2007). resulted in the heated discussion of equality versus excellence. and that i t would have a p ern icio us l abe ling ef fec t among schools. spective and interest of each stakeholder. spectives of both sides without considering what’s-going-on data. allowed to distort curriculum and instruction… (p. 9). leadership of principals and the internalization of accountability. and professionals to understand mutual perspectives and realties. stration (pp. 463-489, 2nd ed.). San Francisco: Jossey-Bass. agenda in education. New York: Routledge. checked 18 March 2010). http://www.dataqualitycampaign.com. Darling-Hammond, L. (1989). Accountability for professional practice. Teachers college Record, 91, 59-80.
tion: A theory of administrative practice. New York: Pergamon. tional Administrative Quarterly, 18, 39-59. Educational Admini st r at i o n, 40, 561-575.
promises and pitfalls of performance indicators in higher education. ASHE-ERIC Higher Education Report No 5. ERIC ED 383278.
agement and Administration, 19, 200-217. Guba, E. G. & Lincoln, Y. S. (1989). Fourth generation evaluation. London: Sage Publ i cations. Habermas, J. (1996). Three normative models of democracy. In S.
ries of the Political. Princeton: Princeton University Press. Teachers professional lives (pp. 1 -27). London: Farmer Press. row’s leaders. New York: Routledge. school district central offices: Toward a policy and research agenda. ory, research, and p ractice (9th ed.). McGrow-Hill: New York. Jones, B. D. (2007). The unintended outcomes of high-stakes testing. Journal of Applied Schoo l Psychology, 23, 65-86. Laird, E. (2006b). Data use drives schools and district improvement. URL (last checked 18 March 2 0 10). tiveness and School Improvement, 18, 273-301.
for Research on Evaluation, Standard, a nd S t u d e n t Testing. State. 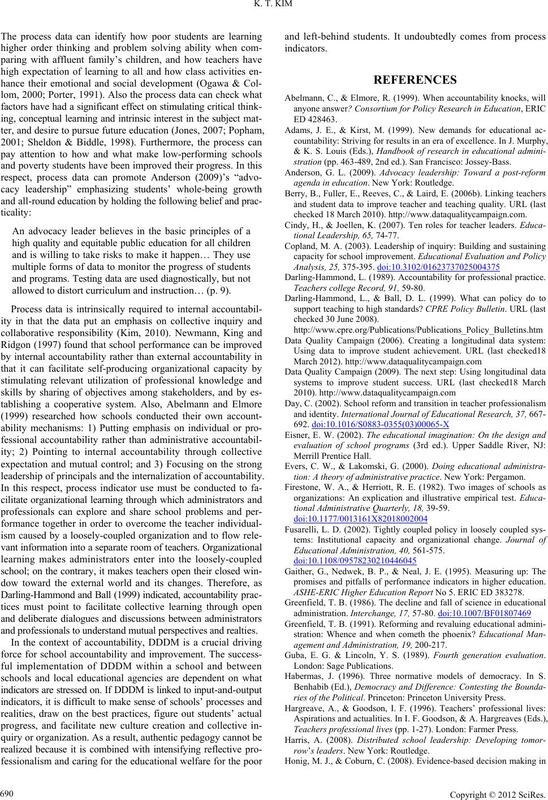 Educational Policy Analysis Archives, 16, 1-32.
center of reform: Learning schools and professional community. cago: University of Chicago Press. checked 28 Novem ber 200 9). and school performance: Implications from restructuring schools. Harvard Educational Review, 67, 41-74.
ment. Harvard Educational Review, 72.
hold schools accountable: Implicit assumptions and inherent tensions. Peobody Journal of Education, 75, 200-215.
southern states. American Journal of Education, 114, 299-332. District and school connections in data-driven decision-making. School leadership and Ma nagement, 29, 477-494. Porter, A. C. (1991). Creating a system of school process indicators. 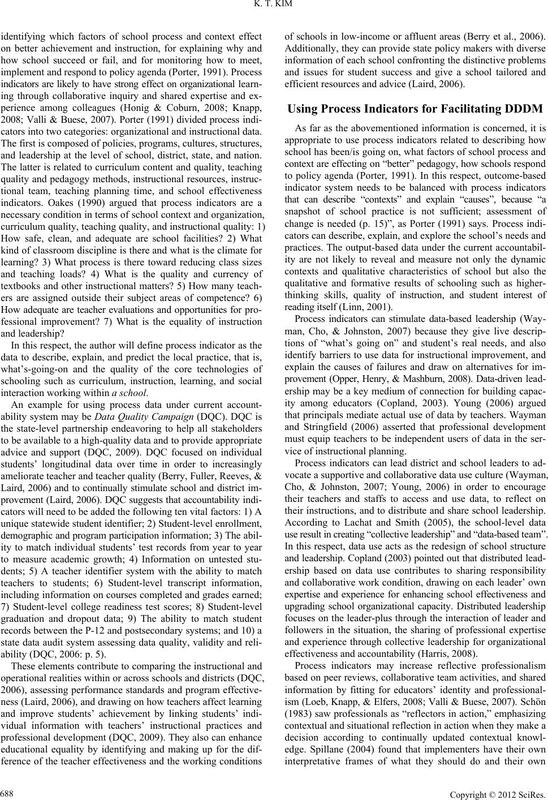 Educational Evaluati o n a nd Policy Analysis, 13, 13-29.
ernment. 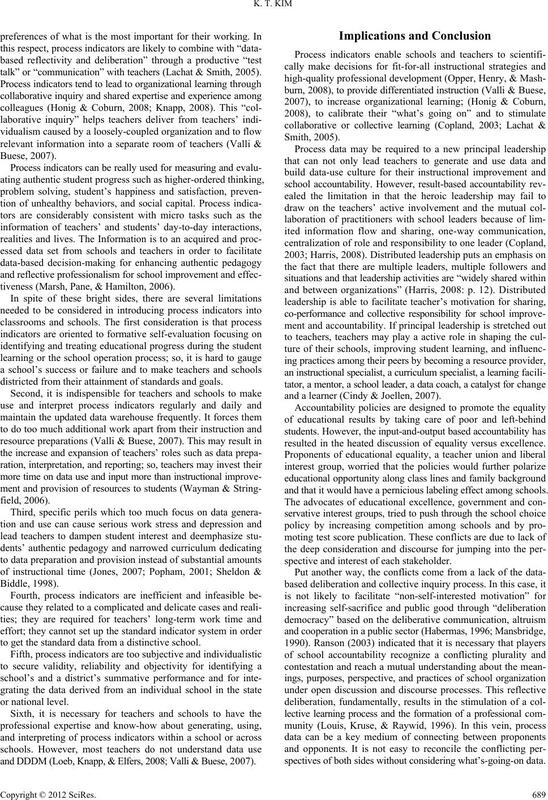 Journal of Education Polic y , 18, 459-480.
stration (2nd ed., pp. 183-202). S a n F rancisco, CA: Jossey-B a s s.
Rothstein, R. (2000). Toward a composite index of school performance. The Elementary School Journal , 100, 409-441.
think in action. New York: Basic Books. Skyes, G. (1999). The new professionalism in education: An appraisal. methodological tradeoffs in operationalizing the leader-plus aspect. 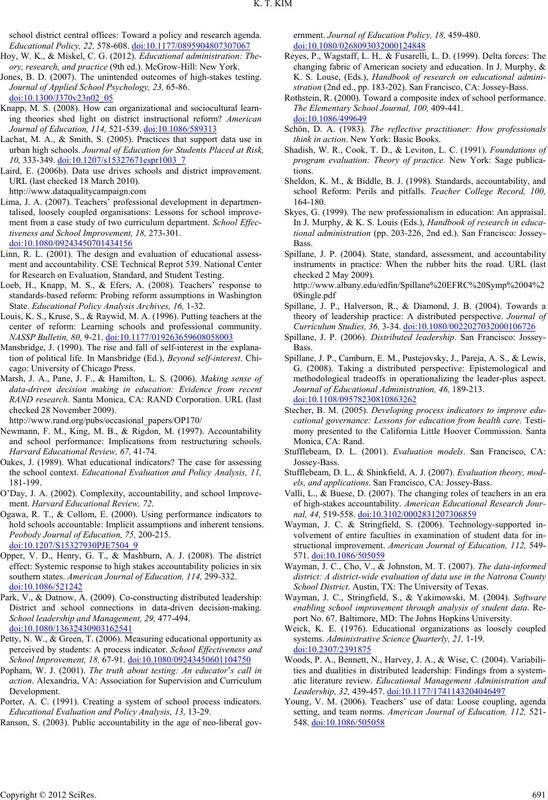 Journal of Educational Administration, 46, 189-213.
els, and applications . San Francisco, CA: Joss ey-Bass. School District. Austin, TX: The University of Texas. port No. 67. Baltimore, MD: The Johns Hopkins Un i versity. systems. Administrative Science Quarterly, 21, 1-19.